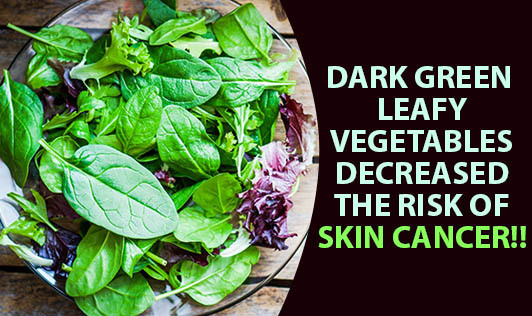 Dark Green leafy vegetables decreased the risk of skin cancer!! A study conducted at the Comprehensive Cancer Center of Wake Forest University involving 12,450 subjects found an association between a greater consumption of dark green & cruciferous vegetables and a reduced risk of skin cancer. Researchers found that increasing intakes of green leafy vegetables were associated with a 51% decrease risk of skin cancer (carcinoma). The study found that those who consumed at least 3 weekly servings of green vegetables cut their chances of developing cancer by up to 65%. People who previously had skin cancer had a 41 % decrease in skin cancer with increasing intakes of dark green leafy vegetables.Dark green leafy vegetables are rich in folic acid, which plays a key role in DNA synthesis & repair. Green leafy vegetable is as important as wearing a hat, sunscreen and protective clothing to reduce the risk of skin cancer!! Protein is a basic foundation nutrient for healthy strong skin & hair. Hair is made up of keratin which is a protein. Excellent sources include fish, egg, paneer, curd, dals, pulses and nuts. Essential fatty acids, such as omega 3 help to keep skin healthy. Sources include tuna, salmon, mackerel, walnuts, flaxseed, and rajma. Adequate water helps you stay well hydrated. It reduces skin dryness, development of wrinkles, & keeps skin soft & supple. Vitamin A maintains skin elasticity, prevents dryness & wrinkles. Include milk, eggs, spinach carrots, pumpkin, Broccoli in your diet for a wrinkle free skin. !!! !.Vitamin C protects the skin against free radical damage. Broccoli,strawberries,citrus fruits have protective properties.Vitamin B 6 produces Melanin which imparts hair its colour.Biotin reduces hair loss.Dont miss out on Whole grains, egg yolk & pulses for that good hair strength & shine !!!! Selenium protects the skin against damage caused by Ultra Violet (UV) light.Include Corn, walnuts soybeans, chicken,fish & egg for that protection factor. Zinc controls the formation of acne.Include Sea foods & eggs in your diet. The entire surface of the skin measures about 20 square feet and weighs between 7 to 9 pounds.